Pip 2, my dice roller for the iPhone, has not been updated for 7 years and counting. The list of “new” technologies that Pip doesn’t support includes retina displays (or actually any displays without the original iPhone aspect ratio), proper multitasking, Universal (iPad) support, and d30s. It is also a 32-bit application in a 64-bit world, that has been running as is since iOS 3. To me it is pretty impressive that it runs at all in iOS 10 and the iPhone 7 Plus. From time to time the Mystery Coconut inbox receives emails from the band of rebels still using Pip asking for news, and once and again I answer with a cordial and noncommittal “it may still take me a while”. What I don’t usually tell the rebels, bless their hearts and their lack of an economics degree, is that it makes zero financial sense for me to do it, and that I only think about it from time to time because, you know, coders have hearts too, and nobody likes to kill their babies. There is a difference though between your apps limping around the App Store and your apps disappearing forever, and that my friends is what a faithful user made me realize when he wrote me last week to say that 32-bit apps will probably stop working in the upcoming iOS 11. So to show you once more that Mystery Coconut works more on principle than on any kind of sensible business plan, I decided to start working on Pip again. My first idea was to simply go ahead and turn Pip 2 into a 64-bit app, update textures and graphics for retina display, and call it good. But then, you know… I actually looked at the code. The lights went out, my eyes began to bleed, and something that was either a Japanese girl with really long bangs or a large dust bunny ran down the hallway behind me. 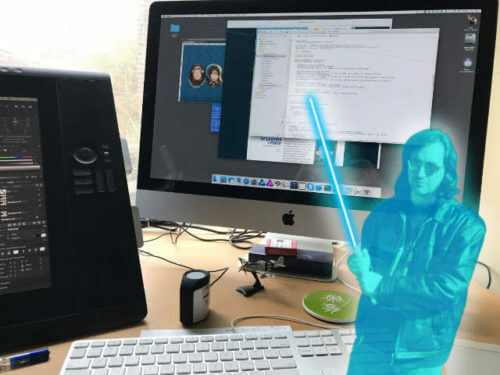 The Force ghost of my coding-fu sensei (that looks a lot like @madgarden) appeared and warned me without words of the dangers of starting over… but almost on its own, like in a Ouija board, my cursor slowly went towards the File menu and selected New Project. Paul‘s ghost likes to appear and stab me fingers when I have a bad coding idea. He is having a field trip with this one. There are a few (bad) ideas of what I could do to make Pip 3 a more interesting update. Second, I could allow people to use stickers on the faces of their dice, to be able to have custom dice of any kind. Do you want a d6 with tentacles instead of fives and sixes to play Eldritch Horror? 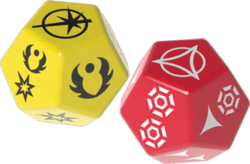 Or do you want to use Pip to play Imperial Assault or Edge of the Empire? 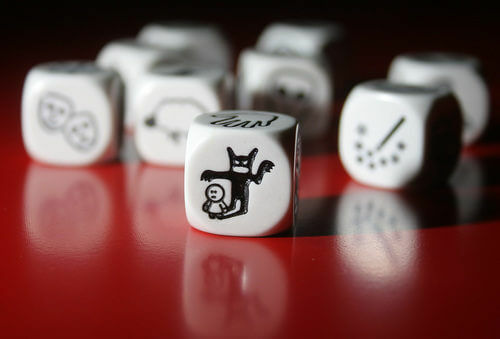 Rory’s Story Cubes? Zombie Dice? Just grab the appropriate shape die, put stickers in all the faces, and there you go. This one may help bring a couple bucks in if I sell the stickers… I just need to get ready for the sanity rolls when reading the reviews on that one. I was also contemplating having Pip show as an iMessage app. Yeah, that doesn’t sound painful at all. Oh, and I should really change the name of the app so people can actually find me in the store. Do I have to lawyer up if I call it Miguel’s Story Cubes? Anyway, let’s open the comments to the band of rebels, see what they think about any of these, or other, changes. Just remember my ghostly sensei is frowning at you. Thanks for making what is, believe it or not, one of the most often-used apps on my phone! ditto what the other guy said. Step one: put out a release that runs on iOS 11. After that, come back to all that neat stuff your talking about for Pip 3. I like the sticker idea. I like the Universal idea. At first I thought the Messenger idea was silly, but it would actually be a neat way for people to play over a distance and see each other’s rolls. But seriously, First just make the basic app. Retina graphics. 64-bit. Go. I await showing my wife the new “what should we have for dinner” die. Seriously, stickers is a cool idea. Good luck and glad you’re still around! I hope the pip update will be soon! I was forced to update and it was my only dice ap that I loved. Puh-leeze! Hurry for the love of dice! !